Universal CityWalk is a multi-level destination featuring shopping, dining, and all sorts of entertainment. Surprisingly, even given how many dining options the complex has had since it opened in 1999, it didn’t feature many choices for a quick meal. 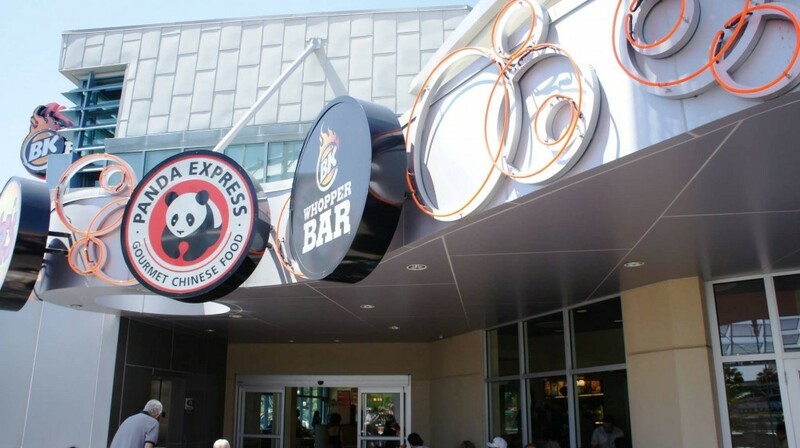 Luckily for those of us who like to grab a quick bite to eat on our way out of the parks — or the night clubs — Universal added a food court to the complex in 2009. It’s located on the second floor, right by the Red Coconut Club and the upstairs exit of the AMC movie theater. There are three restaurants in the food court: the Burger King Whopper Bar, Panda Express, and Moe’s Southwest Grill. 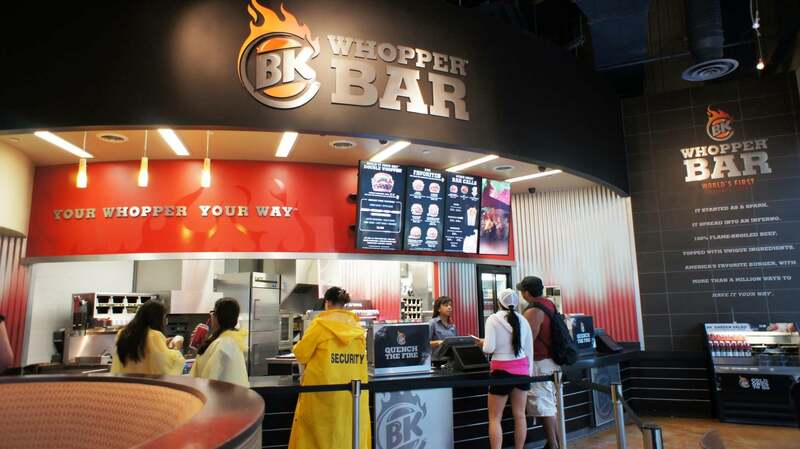 Universal made a pretty big deal about the BK Whopper Bar, as it was the first one in the country to open. The idea here is to have a slimmed-down version of a Burger King with contemporary styling and a build-your-own-Whopper bar – think of it as a limited Chipotle or Moe’s. 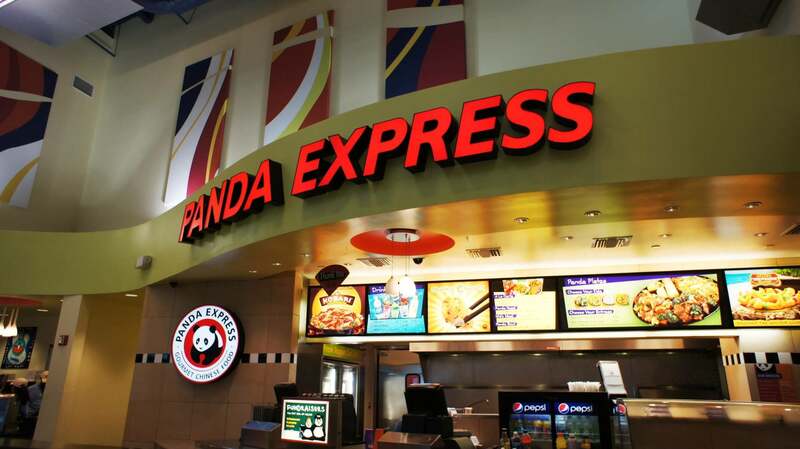 Panda Express has what you typically would expect at a fast-food Chinese restaurant, including Sweet and Sour Chicken, Mandarin Chicken, Broccoli Beef, Kobari Beef, BBQ Pork, and more. If all that walking and dancing and drinking or whatever it is you do at Orlando has got you in the mood for Mexican fast food, then head to the back of the food court and step up to Moe’s. You’ll find something to be happy about on their menu, whether you go with one of their famous burritos or quesadillas or just get some chips and guac to munch on. 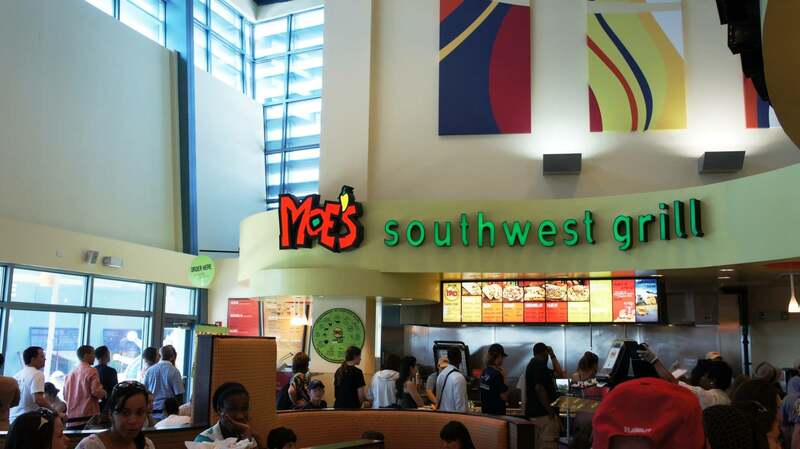 Best known for its signature items such as the Homewrecker burrito, Close Talker salad, and Joe Coctostan quesadilla, Moe’s serves fresh, made-to-order southwest fare with attitude and flare. Each guest is greeted with a warm, “Welcome to Moe’s!” and is offered complimentary chips and salsa with every meal. The exceptional value and service make Moe’s one of a kind. Served in a flour or whole grain tortilla with rice, beans, shredded lettuce, and pico. All served with guac. Served with seasoned rice, beans shredded cheese and pico. All kids’ meals come with a cookie and kid-sized drink.